When my oldest son moved into his room in our new house, he had some trouble falling asleep. After many sleepless nights of having a little one bunking with us, we were desperate. We decided to play music on a CD player to lull him to sleep. NHL is now six years old and still likes to fall asleep to music when at home. We have searched near and far for music that we all can work with. For the longest time, we only had one CD and it was used every night. Let’s be honest, there are only so many days in a row that an adult can handle listening to The Wiggles sing your child to sleep on a baby monitor. Recently, I was contacted by Rockabye Baby! to review some of their CD lullaby renditions with family. This was not the first time I had heard of their music. One of their CDs was on the list of items to get for my new nephew when he is born in February. Of course, this was to keep not only him, but my brother happy as he rocks his son to sleep. Rockabye Baby! is staffed by music lovers from all corners of the world. Headquartered in the Los Angeles neighborhood of Silver Lake, the label was born of the need to make children’s music cool–not only for babies but for their parents too. We turned to our record collections for inspiration: punk, metal, classic rock. The resulting albums are revolutionary yet reverential. In other words, the perfect gift for a newborn, new parents, or yourself. Part of the CMH Label Group, a thirty-year-old independent bluegrass and roots-music stronghold that houses a variety of musical styles under its umbrella, including metal, rap, punk, and string quartet tributes, Rockabye Baby! is the latest addition to a diverse musical family. Says label Vice President Lisa Roth, "First and foremost, we’re fans, so we take care to make every album musically interesting enough to satisfy adult listeners. Believe me, making an album that’s gentle enough for sleeping babies but won’t bore Mom and Dad is trickier than it sounds." Producer/arrangers would agree! The job’s not easy, but it’s immensely gratifying to hear from pleased parents that Rockabye Baby! is now a treasured piece of their family history. When you go to the Rockabye Baby! online store, you are able to listen songs from each of the albums to help make your decision. It really is not easy since they all are catchy and nice to listen to. While there, be sure to vote for who you would like to see as the next Rockabye Baby! CD. The list includes: Bob Dylan, Bon Jovi, Jimi Hendrix, Janis Joplin, Stevie Wonder and Slayer. In addition to the music, Rockabye Baby! also have limited edition Long Sleeve onesies. You can also receive up to 20% off your orders for a Holiday offer good until December 31. For more details click here. We were sent a complimentary copy of the newest Rockabye Baby! – lullyby renditions of Guns n’ Roses along with lullby renditions of Aerosmith. When the CDs arrived, I was extremely excited to test them out. Of course, I could not wait until bedtime. I decided to open up the Aerosmith one first. The first thing I noticed was the playful Aerosmith cover art on the CD case and inside. There were also teddy bears paper dolls that were decked out in items from Aerosmith. One of the extremely nice touches was a fabulous note from Steven Tyler (this CD was released in 2009). He wrote that he liked how Rockabye Baby! not only did a cover of Aerosmith’s songs, but took a unique approach to it. He also mentioned that he will be playing these for his grandson. NHL fell asleep in record time that night. The best part was both of the boys asked to listen to the music while playing with trains in their room. NHL has also asked to hear the real renditions of the songs from Aerosmith and Guns n’ Roses. This will be nice to share with him and expand his musical appreciation. We are definitely going to purchase one of these CDs for my new nephew and add more to our collection of night time music. I just need to touch base with my family to see which one they would like since there are so many groups that I know my brother loves. If you need a baby shower gift, or unique item for a music lover, I highly recommend Rockabye Baby CDs. 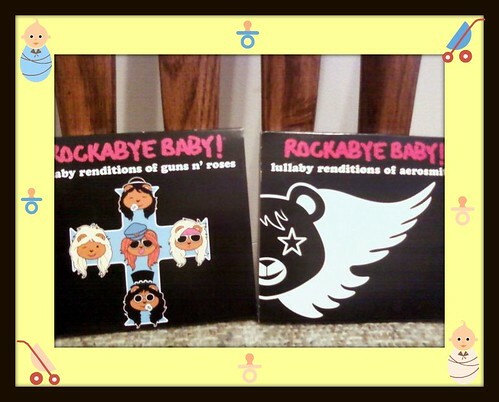 Disclosure: I received the Aerosmith and Guns n’ Roses CDs complimentary of Rockabye Baby! in order to facilitate this review. No other compensations was given. The opinions expressed in the review are my own feelings about the products that my family tried. I’ve heard of these…they sound so cute! I wonder if it would help my little guy get to sleep faster. At least we’d both enjoy the music! .-= Mommy Cracked´s last blog ..A Different Kind of Christmas =-.